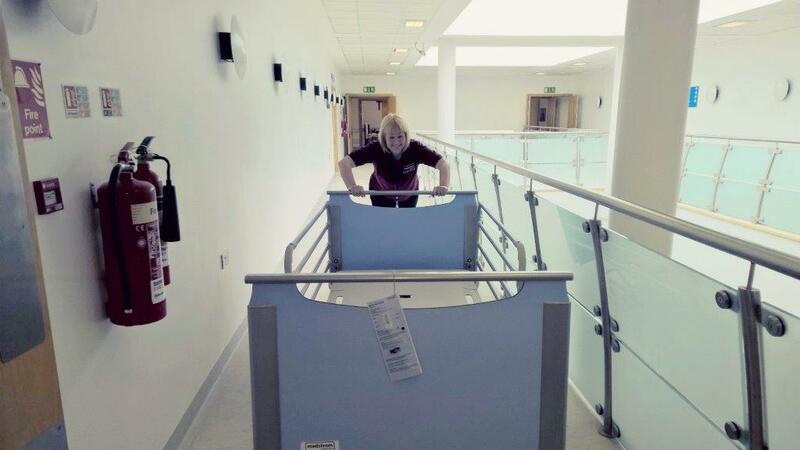 16th July 2015 – On Saturday 9th May and over the weekend of 30th-31st of May 2015 Medstrom Healthcare in partnership with Cardiff and Vale University Health Board completed the installation of 72 ‘low’ beds at St. David’s Hospital in Cardiff. The recipient wards were Elizabeth, Lansdowne and the Rhydlafar Unit. Eight Medstrom Healthcare staff with support from ward staff swapped out the old and dated beds. The new ‘low’ beds are electrically operated and have the main benefit of going down very low to the floor, to a height of just 19cm. This means that vulnerable patients such as the very frail or those patients with dementia who are at risk of falling out of bed can be protected and placed in a very low, safe position. The new beds have a number of additional safety features including an articulating electric backrest that ensures that when the backrest is raised to sit the patient up friction does not occur between their back and the backrest, helping to protect skin from damage. Over the same time period Medstrom also installed 120 AvantGuard medical/surgical beds into other acute areas across the health board, replacing old electric beds and beds that had no side rails. This ensures that patients are better protected, particularly as the patient population becomes increasingly vulnerable.